Emerson Process Management announces the release of a new range of digital valve controllers from Fisher designed to maintain performance and reliability in harsh environment applications. The new Fisher FIELDVUE DVC6200p series digital valve controllers are recommended for applications in which accessibility, extreme temperatures (up to 120°C), extreme vibration or confined space make integral mounting difficult or impractical. For instance, pulp and paper and metal and mining industries have typically preferred to isolate valve mounted instruments from harsh environments. 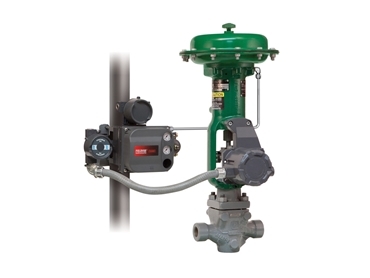 The remote mount version of the DVC6200p series features the valve position feedback mounted on the control valve, while the remainder of the digital valve controller can be mounted over 300 feet away in a less severe or more accessible environment. The remote valve mounted feedback unit utilises the patented FIELDVUE linkage-less, non-contact feedback technology where there is no physical contact between the valve stem and the instrument. With no linkage to wear, loosen, corrode or vibrate, the feedback unit can withstand a plant’s operating extremes. FIELDVUE digital valve controllers offer proven performance in difficult process environments with over one and half million units installed worldwide. Key features of the DVC6200p series digital valve controllers include using PROFIBUS PA to provide alerts, trends and diagnostics allowing for visibility and control; support for EDD files allowing for quick and easy configuration; quick setup and calibration, including performance tuning allowed to be performed locally in minutes; and leading PROFIBUS configuration tools available for more extensive parameterisation. The DVC6200p is offered with CSA, IECEx, ATEX and FM hazardous area approvals and is also listed in the Lloyd’s Register for industrial, marine and offshore applications.